Efficient heating and lighting are essential additions to any outside entertaining or relaxation area. They help extend its use even when evenings get a little chillier and darker. These high-quality options provide practical, solutions and allow you to live outside even as summer turns into autumn and winter. To take the chill off the evening air we have a range of infrared wall-mounted heaters. These will give customers more time outside enjoying their gardens and will come into their own for those barbecues or evening events that carry on once the sun has gone down. Our Infrared Wall Mounted Heaters have ceramic elements that are designed to gently warm those underneath the canopy, using infrared radiation which is completely harmless and contains no ultraviolet radiation. The high quality ceramic plates generate heat quickly and reach their full operating temperature within less than 10 minutes. Each unit is supplied with a two-year guarantee against faulty materials from the date of purchase. 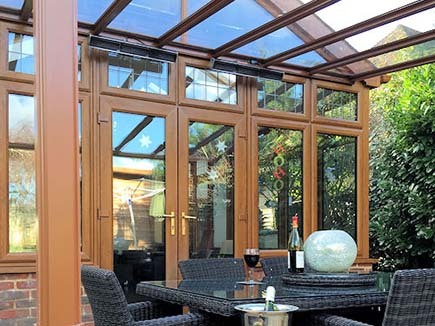 T hey are a stylish and practical addition to any canopy or veranda. Black Ceramic Plates with a Black Body.